Recently my family visited to help celebrate my son's graduation from college. 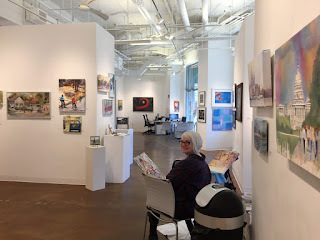 While they were here they browsed through some of my paintings and my ever astute brother, commented that it seemed like I had two styles to my work; some are loose and others are very detailed. Student Brushes falls into the latter category. I was aware I did this in my work. I find that after finishing a detailed painting like this one I feel like I need to do something more fluid. 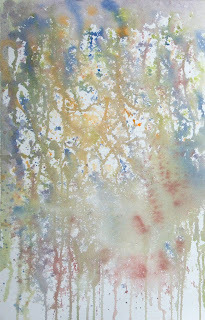 The shift makes me relax and focus more on responding to what is happening with the paint and less about the details. What you might find interesting, however, is that those "loose" paintings require so much concentration to pay attention to the paint and respond that they can be exhausting. So what do I do next? 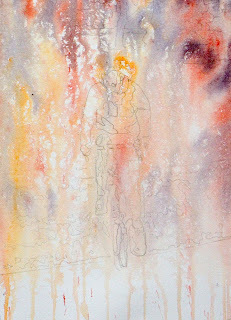 I start a detailed painting which I have well planned and the cycle begins over again. At the beginning of a painting like Student Brushes I find I get very relaxed, just chipping away to create the image. I often have to work out how to accomplish the look of something in the painting. For example, the brushes with lots of old dry paint were a bit of a challenge when I started, as was keeping the metal ferrules looking shiny, yet dotted with paint. Once I have figured out how to render the subject I repeat it until the painting is done. I am nearly always really happy with the final result on these detailed paintings since I have done a lot of planning and design before I touch brush to paper. 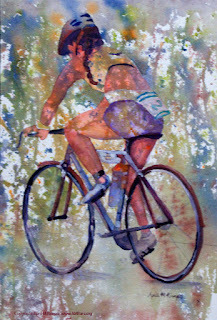 I am happy to report that not only I liked this one, but so did the juror of the San Diego Watercolor Society 33rd International Exhibition and more recently Sterling Edwards, the juror for the Pennsylvania Watercolor Society's 35th Anniversary International Juried Show. More thrilling is that the painting found someone who loved it and wanted it for their home. As always, thanks to HorseSpirit Arts Gallery for their wonderful caring staff who help find homes for my work and that of 40+ other artists. It is fascinating to me that I like both approaches to watercolor and that I actually need both to keep me happy. 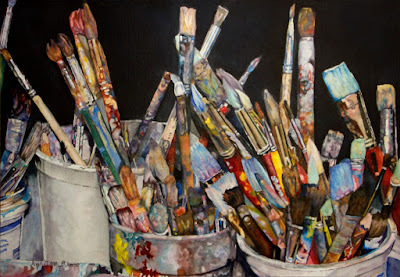 Do you find you have any interesting quirks in your approach to painting? I'd love to hear about them. Continuing with my series Masterful Musicians, Connecting represents my awe of this master Blues, R&B, and Jazz performer, Vanessa Collier. 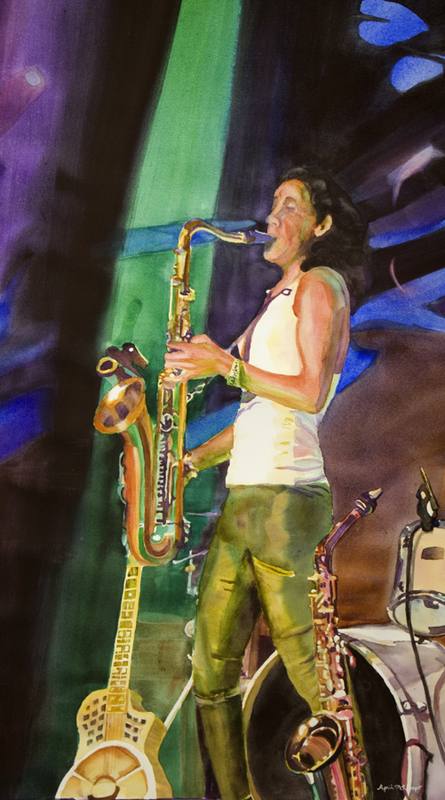 Multi-talented, Vanessa writes much of her music, has a voice to die for, performs incredible solos on the sax while roaming among the audience, and shares soulful pieces on the guitar. She gathers a number of young talented musicians around her delivering a show that connects so well with the audience you will never forget her. Some songs grab onto you and you find yourself humming them for days after watching this masterful woman share her love of music and energy in every performance. Play your heart out, Vanessa Collier. Check out this painting during my two-person exhibit with Elaine Weiner-Reed, Portraits of Life: The Art of Storytelling. Elaine is equally mesmerized with Vanessa Collier's music and will also have some paintings that celebrate Vanessa's music. 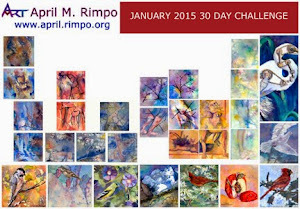 Rimpo and Weiner-Reed are passionate about their paintings telling stories about life. Although they work in other subject matter, portraits are their favorite subject for telling stories. Their art explores the depths of the world around them: portraying cultures and people, honoring history and traditions, depicting the emotional content of an encounter, and revealing the undercurrents of human interaction. Based in the Washington DC area, Rogue Collective explores "the gap" between classical and popular music through collaboration, original composition, improvisation and performance. When sitting in a park (Madison Square Park in NYC) a woman appeared in the distance carrying a parasol to block the bright sun. As she passed in and out of shaded spots the umbrella would light up like a spotlight. 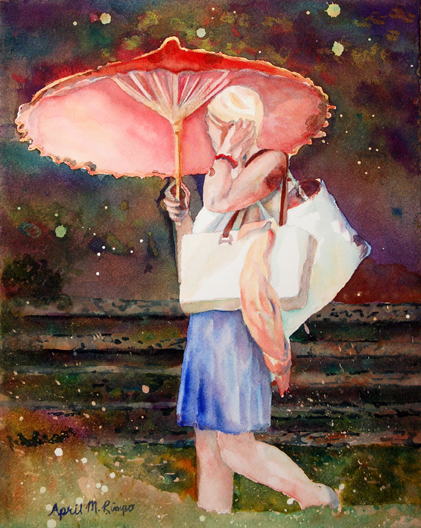 She was wearing light colors and her hair was blond so she appeared to almost glow against the backdrop of the park. With my camera at the ready I started taking photographs as she walked in hopes of catching a moment when she was lit up by the sun. I wanted to feature the stark contrast between the glowing woman and the dark textured foliage and fence rails that she passed. My painting, Aglow, was the result. I decided I wanted to make the background very colorful to add a lot of interest since I planned to make the colors of the woman very light and simple. The contrast of light against dark augmented with simple versus complex color blends felt right. I chose to use fluid acrylics for the background which I first applied in a few areas and let partially dry before washing off most of the color. 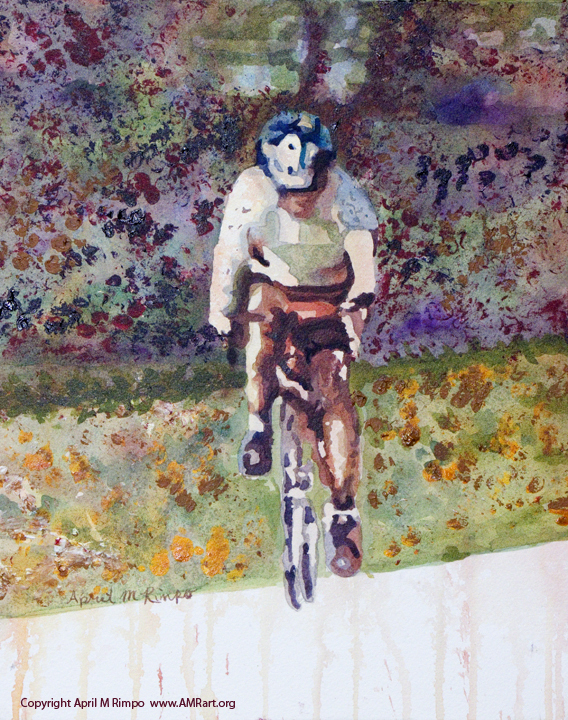 This approach leaves a ragged edge "batik-like" appearance that added texture to the background. While the background was very wet, I flowed in a wide variety of colors: blues to make the orange parasol pop, reds, greens, golden, and purple hues that blended and swirled to make wonderful variety in the dark background. 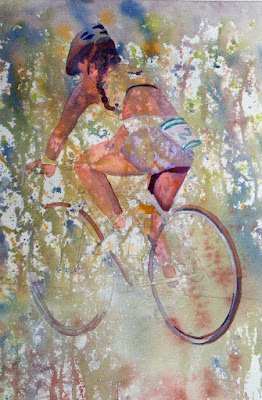 The balance of the painting was done with watercolor. I saved some spots of white which I later tinted with pale colors to add a bit of sparkle throughout the painting. In Serenity Found my goal was to create a painting that could provide a great place to relax at the end of the day. Taking inspiration from a photograph I took mid-morning and shifting it to sunset allowed me to contrast the distant mountains with the near desert plain using complementary colors and cool versus warm colors. I decided to make it an early sunset so the horses wouldn't be entirely backlit, allowing me to show some of their details. I hope you enjoy viewing this painting and that it has a healing effect on you, removing any stresses from your day. March 9 through April 26, 2019. Wondering how these paintings evolved? Sometimes you can't really tell when you look at a finished painting where is started from. I think Cycling falls in that category, while Race is much more obvious. Let take a look. First I created the backgrounds for the two paintings by spraying water and applying fluid acrylic paint until I had the "netting" background I like to use when painting high energy paintings. 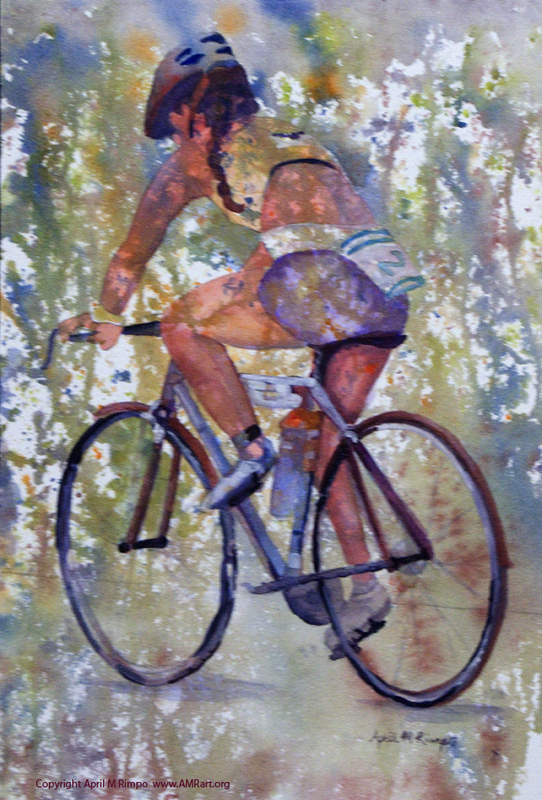 My cyclist paintings are nearly always in this category because they are so active when they flying by. You can barely see the warm underpainting that was the beginning of Cycling in the final piece. 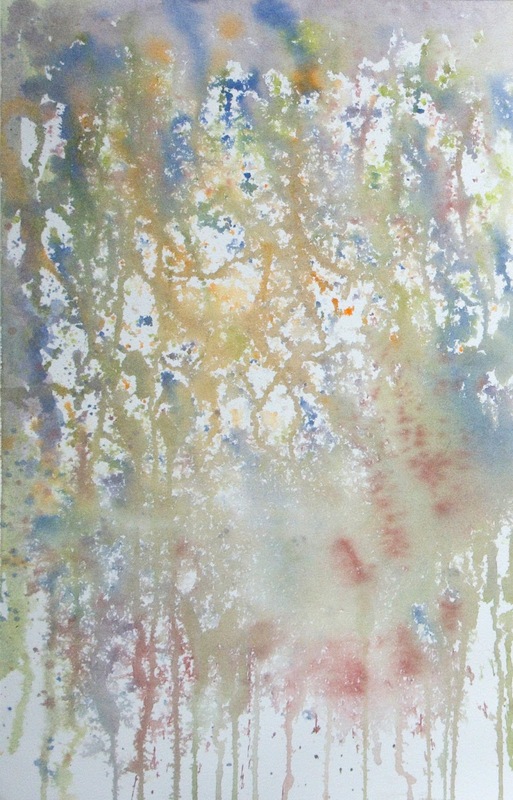 It evolved through a variety of stages eventually ending up with a fairly dark background of purple, burnt orange, and dark greens to represent the natural treed background. A lighter swath of mostly pale greens and yellows for the grasses by the road that are lit by the sun. Only the drips that cross the road remain from the underpainting. On the contrary, I decided to start by painting the woman in Race allowing some of the underpainting to come through providing the illusion of shadows on her body. I so liked this appearance I shared the painting at the stage shown at left with some artist friends to get their feedback. They all felt the simplicity was perfect and that I should not develop the background further. My intuition had told me the same thing, so it was nice to get validation of my thinking before I went further. I continued to work on Race as part of a demo in a gallery where I had a solo show on exhibit. The images below show me completing some details in the bike and reinforcing parts of her form to get to the final version shown above. My thanks to Mala Sarkar Sehgal for taking these photos while I worked. Jazz music has been one of my favorite genres of music for quite some time, but perhaps my love of this music grew just a bit more after a visit to New Orleans during Jazz Fest. The energy at this 5 day event was contagious and we roamed around between the 21 different stages and performance venues to take in as much as we could. Last summer the "Voodoo Threauxdown" tour come to Baltimore and my husband and I bought tickets immediately. We knew some but not all the groups who performed that night. The energy again was high. The various performers gave their all and we took it all in, loving every moment. This concert has resulted in quite a few paintings by me, with even more planned. 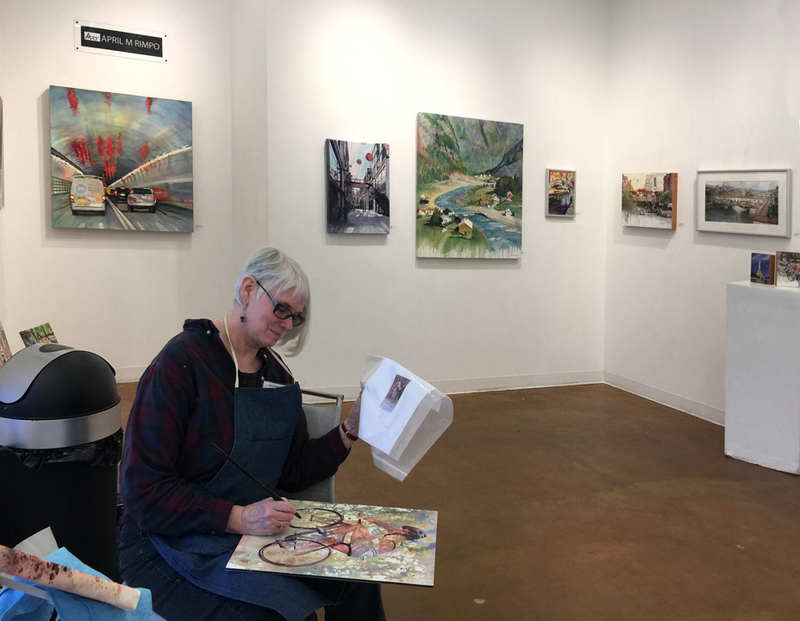 I'm saving most of these paintings for a first reveal at my exhibit "Portraits of Life: The Art of Storytelling" that will feature artwork by me and Elaine Weiner-Reed. This will be one of my paintings. 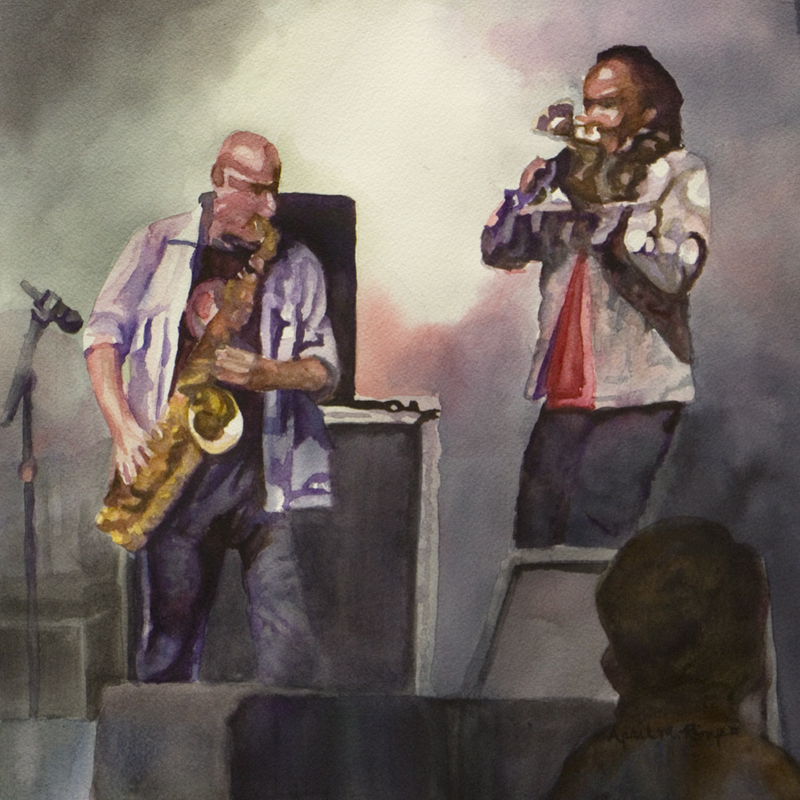 Jammin' features the saxophonist and trumpet player from Galactic. 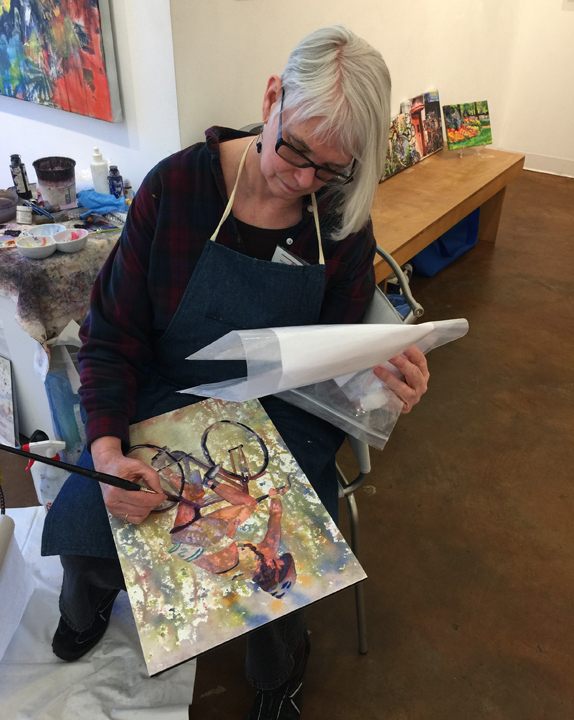 Interested in April's artwork or taking her classes? Consider becoming a Studio Friend by signing up for her twice-monthly email. April segments her newsletter so you can select topics you'd like to hear about when you sign up. For those who include a selection of General Interest you will receive emails about twice-monthly. If you are only interested in classes, then the emails will be much less frequent discussing upcoming classes and how to register. Thank you for your interest.